← Alcohol Good. Diets Bad. Spanish Advertising Rocks! Question: How would you lure more Mexican customers to your Memphis-area gas station? Answer: Offer additional services such as check cashing and money remittances to Mexico… and then use the Pemex brand -and logo- to give the business a truly local feel. This entry was posted in Immigration, Marketing & Advertising and tagged Memphis, Pemex. Bookmark the permalink. 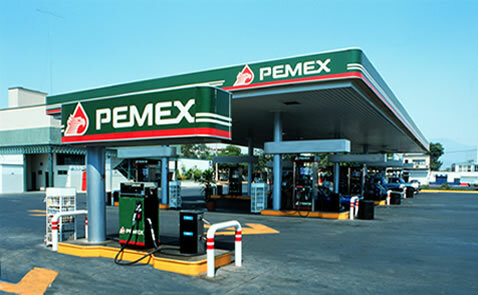 I am a Mexican living abroad and although I enjoy reminders of “home” I do not -and will not- enjoy the sight of a Pemex station! I’m a Chicano that spends a lot of time in Mexico and always look forward to pulling into a Pemex station. The gas is cheaper, the premises cleaner, somebody washes your window, and if I could get some good Mexican food at a Pemex in Memphis that would make my day. Certainly brings a completely different dimension to multi-culturalism. Yep, the guy stole a brand, its copyright and everything else… but you’ve got to admit he was amazingly on target with the brand he stole! Do they adulterate gas like in México?